I splurged last St. Patrick’s Day and bought some clearance items to use in the future (I only make one or 2 St. Patrick’s Day cards, I don’t feel pressured to purchase something new every year). This one is for Mom & Dad. Supplies: Stamp – Hero Arts, paper – Echo Park Lucky Charm, Neenah Classic Crest Solar White, Poptone Sour Apple, Stampin’ Up! Confetti White, Stardreams Gold, ink – VersaFine Smokey Gray, dies – My Favorite Things (pierced rectangle), Taylored Expressions (shamrock), embossing powder – Stampendous Gold Detail, twine – Martha Stewart. Categories: card, holiday | Tags: card, Echo Park, Hero Arts, Martha Stewart, My Favorite Things, Neenah, Poptone, Stampendous, Stampin' Up!, Taylored Expressions, Tsukineko, VersaFine | Permalink. Nice mix of patterned papers, Kathy! To my shame I never do St Patrick’s Day cards. Thanks, Gillian! 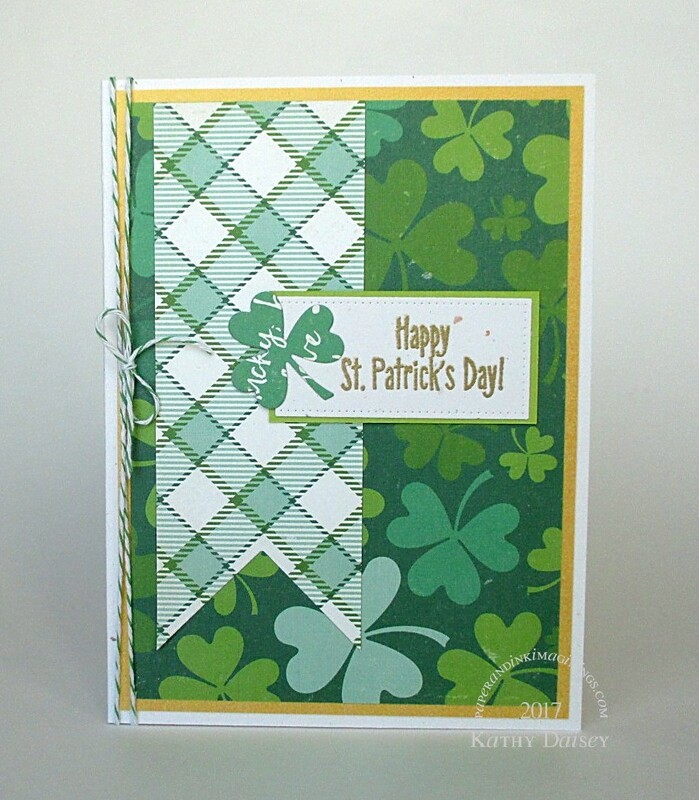 Maybe Hallmark hasn’t made St. Patrick’s Day into a card holiday on your side of the ocean? Not as big as in the US, or Ireland of course! But as both my parents were born in Ireland, I really should make an effort! I find St. Patrick’s Day cards difficult, because my family tends to the really funny or punny ones – maybe next year I will look for some digital images that lean that way.